A few weeks ago the nice people at Kerrygold offered to send me a package stuffed full of grass-fed cheeses and butters in exchange for two blog posts that featured their products*. As I said before, I love Kerrygold, so I was more than happy to participate! For November they wanted me to create a Kerrygold cheese and meat board featuring Dubliner with Irish Stout, Aged Cheddar with Irish Whiskey, Aged Cheddar, Blarney Castle, and Dubliner cheeses. I decided to get a little creative and make some homemade cheese crackers and a creamy cheese spread to be the centerpiece of my creation. 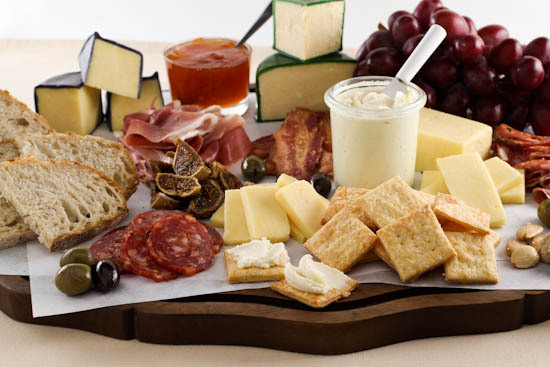 For me a good cheese and meat board has a variety of flavors and textures. 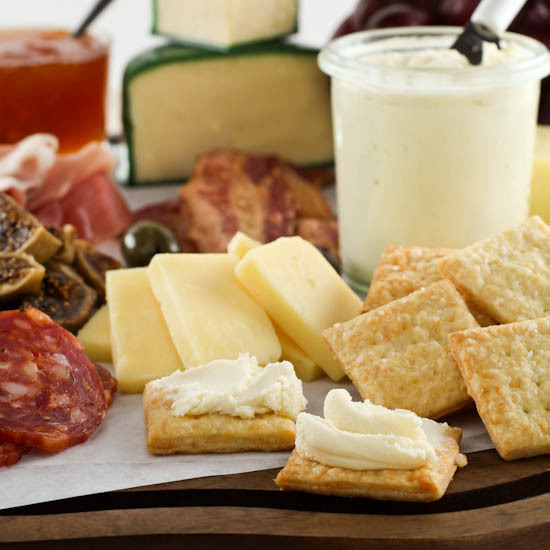 So, what will you find on my cheese and meat board? 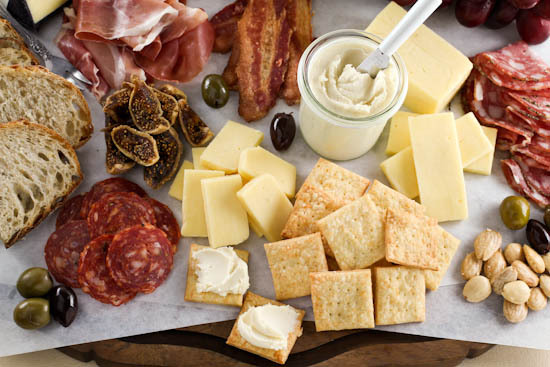 Well, aside from a selection of yummy Kerrygold cheeses, I like to include cured meats that range in flavor from mild to spicy – I used prosciutto, peppered salami, and hot soprasetta this go round. I also like slices of rustic sourdough bread, dry fruits like figs, fresh fruit like red grapes, fruit spreads like apricot jam, and salty fare like olives and crisp slices of bacon. The anchor of the board is my homemade crackers made with Kerrygold Dubliner cheese, and my spread featuring Aged Cheddar with Irish Whiskey. These recipes are dead simple and are actually better when made a day in advance. If you have never made homemade crackers before you will not believe how easy they are. I have been making crackers for years and they always impress! The cheese spread made with Aged Cheddar with Irish Whiskey also has a tablespoon of whiskey to loosen things up a bit, but you can substitute water if you prefer. 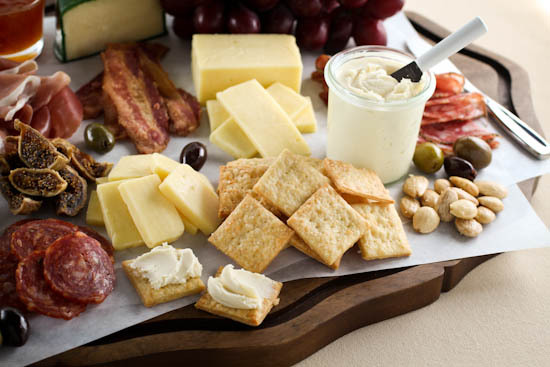 Begin by preparing the cheese spread. 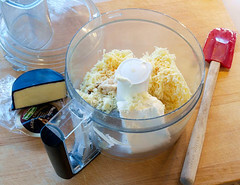 In the work bowl of a food processor combine the cream cheese, shredded cheese, whiskey, horseradish, onion powder, garlic powder, Worcestershire sauce, mustard powder, and salt. Process until the mixture is smooth, stopping to scrape down the sides of the bowl to make sure all the cheese is thoroughly processed, about 1 minute. Transfer the mixture to a container, cover, and chill for at least 4 hours, or up to 3 days. 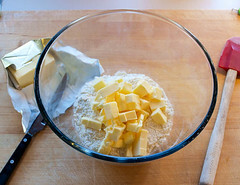 In a medium bowl combine the flour, salt, sugar, baking soda, and mustard powder. 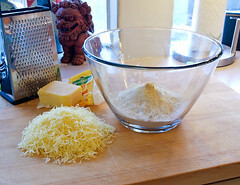 Add the shredded cheese and toss to coat the cheese thoroughly in the flour mixture. 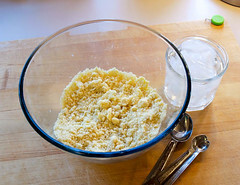 Add the cubed butter and, with your fingers, rub in the butter until the mixture resembles sand with a few larger pea sized pieces of butter remaining. Add 3 tablespoons of ice water and mix until a shaggy ball forms. Add additional water, 1 tablespoon at a time, until no dry flour remains in the bowl and the dough holds together when you squeeze it into a ball. Turn the dough out onto a surface lightly dusted with flour. 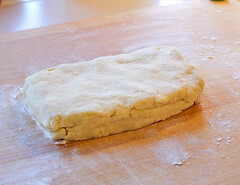 Press the dough out with your palm to form a rough rectangle. 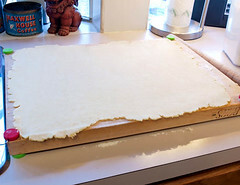 Fold the dough in half, turn the dough ¼ turn and repeat this process 4 more times. Wrap the dough in plastic wrap and chill for at least 1 hour, or up to 2 days. 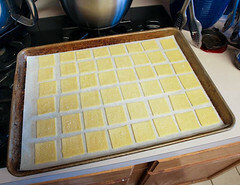 Heat the oven to 375 F and line two baking sheets with baking parchment. Once chilled, remove the dough from the refrigerator and let stand at room temperature for 10 minutes. On a lightly floured surface roll the dough into a rectangle that is approximately ⅛-inch thick, about 18x14-inch rectangle. Cut the dough into 1-inch square crackers using a pizza cutter and a ruler. 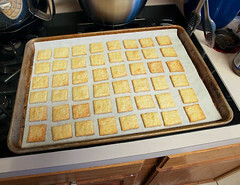 Place the squares onto the prepared baking sheets and dock each square with a fork and sprinkle the tops of the crackers lightly with Kosher salt. Bake the crackers for 9-12 minutes, or until the crackers are golden brown all over, and deep golden brown on the bottoms. Let the crackers cool completely on the baking sheet. Store the crackers in an airtight container for up to 3 days at room temperature.